Can You Recover Lost Files from a Broken GPS? When Andrew’s GPS was run over and broken, he panicked! Losing his GPS data would mean repeating weeks’ worth of work. Fortunately, with help from FlashFixers, he didn’t have to! This broken GPS was run over by a truck. This story is from Andrew Rist of Pine Ridge Technologies in Wakefield, Massachusetts. Andrew had been using a Magellan eXplorist 710 to survey street light locations in Massachusetts towns. He had just finished surveying over 1,700 geographic locations, or waypoints, when his field electrician accidentally dropped the GPS and a passing truck ran over it. The GPS was completely shattered and not working at all! If Andrew could not get it working, it would take weeks to retrace all his work and recreate the data from scratch. At first Andrew tried to fix the problem himself. He took apart the broken GPS to access the logic board. Then, he put the logic board from the broken unit into an identical working Magellan GPS. But it still would not even power on. Frustrated, and knowing that he now had a bad logic board, Andrew started searching for data recovery companies. Andrew found FlashFixers through a referral. He heard that FlashFixers had prior experience recovering data from mobile phones and hard drives using a “chip-off” method. 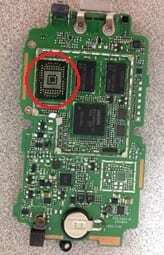 Could the same “chip-off” method be used to recover lost data from a GPS? Andrew contacted FlashFixers, and together they discussed the options. Even though FlashFixers had never done GPS “chip-off” recovery before, both Andrew and FlashFixers were willing to give it a try! Although all of the data was retrieved, it was not in a readable format. The raw image from the memory chip had multiple partitions. Without knowing which partition held the data, a complete recovery would be impossible. But FlashFixers had done this many times before with Android phones. Using their past experience, they were able to quickly identify the correct partition containing the waypoints and interpret it into a valid file system. Now, not only was Andrew’s data found, it was also readable! In February 2016, Andrew’s GPS became FlashFixer’s first GPS recovery, and we hope it won’t be our last! We are always up for new challenges as we help others recover digital data, whether from mobile phones, hard drives, memory cards, or now GPS units. We appreciate all of our customers for trusting us with their data recovery cases, whether it’s a simple recovery or something we’ve never done before. Thank you!